MORNINGSIDE HEIGHTS — Instead of spending the summer at the pool, Arif Mahmud, 17, spent his time working in a lab. Mahmud was one of 25 high schoolers in the Harlem-based science incubator Harlem Biospace's inaugural summer program, HK Maker Lab, which recruited students to spend four days a week for six weeks at Columbia University in order to learn about biomedical engineering. 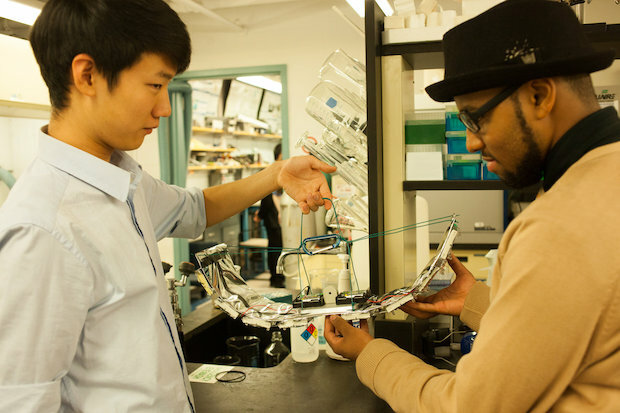 "It is really amazing to see something that started off as just an idea in your head become a physical bio-medical product," said Mahmud, a senior at Brooklyn Technical High School who was part of a team that invented a reliable light source for surgery rooms in international hospitals that lack sufficient energy infrastructures. Other students in the program created products to solve global health problems like finding a low-cost and efficient way of keeping newborns warm in places that don’t have incubators. Organizers said this year's first-ever program ran even better than expected. Apart from teaching high school students biomedical engineering, the program exposes them to the college environment and shows them how obtainable that goal is, Kyle added. Maker Lab, for instance, recruited students from regions with the fewest college science and math majors as well as students who qualify for free or reduced-price lunch, according to their website. The summer was also a success for the Harlem-based nonprofit Silicon Harlem, which ran its first Apps Youth Leadership Academy, a seven-week program, out of City College. Twenty high school students from Harlem learned coding and design to develop their own apps as part of the training, according to Marta Moreno Vega, who organized Silicon Harlem and is president of the Caribbean Cultural Center African Diaspora Institute. During the program, students had a chance to pitch their ideas to Google, said Clayton Banks, executive producer of Silicon Harlem. Among the apps produced by students were a procrastination-fighting task time managing app, a network pairing young people with internships and job opportunities and an app linking people to social events happening in their neighborhood. Angelica Luna, 17, a senior at the Young Woman’s Leadership School of East Harlem, said her time at Silicon Harlem was a challenging but worth it. “I figured out that coding is hard,” said Luna, who worked with a group of four other students to develop a meet-up app that lets people pick a rendezvous spot and gives them personalized directions. “It was something new for me because in Harlem we don’t always get these opportunities,” Luna added.